Penbox: Sheaffer Pens. Sheaffer Legacy, Valor, Intensity and Prelude Pens. The Sheaffer Legacy Heritage brings together the classic elegance of timeless Sheaffer design with the effortless convenience of modern day style. The range comes in a variety of finishes to suit every lifestyle and taste. With its wide bodied barrel tapering to an inlaid 18k gold nib, the Sheaffer Legacy Heritage fountain pen is the natural choice for those who prefer a wide bodied pen. With its classic yet bold design, the Sheaffer Valor collection evokes a sense of hard-earned accomplishment. A Sheaffer Valor writing instrument offers exceptional quality and writing performance. It features a robust wide-profile acrylic body with an easy screw-on cap, enhanced by 22k gold or palladium plated trim. The fountain pen features the exclusive Sheaffer inlaid nib in 14k gold, available in fine, medium and broad, and fills via cartridge or converter. Sheaffer Prelude pens are finished with 22k gold plated or chrome plated trim. The fountain pens have a triangulated section for extra comfort when writing and are fitted with 22k gold-plated or chrome-plated nibs. The range features an array of finishes that appeal to men, women, business executives and working professionals alike. 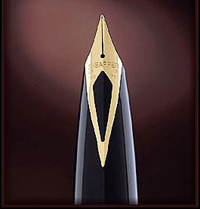 Its wide profile and smooth finish make it a favourite for those desiring an easy and pleasurable writing experience. All Prelude Sheaffer pens are backed by the Sheaffer warranty. FREE ballpoint pens with some fountain pens whilst stocks last! The Intensity fountain and ballpoint pens are available in a choice of finishes that include a combination of chrome and black, ultramarine, cornflower or violet lacquers. Slim bodied with a screw on cap the Intensity fountain pen or ballpoint are gift boxed.